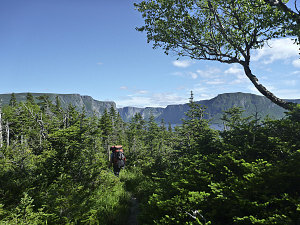 Note: This page describes, in detail (and with lots of extra pictures), our two-day backpack to Snug Harbour on Western Brook Pond, in Gros Morne National Park. This backpack was part of our 2-week "overland to the rock" Newfoundland Trip. If you came to this page looking for the general narrative for that trip, then you have come to the wrong place. You should go here instead. 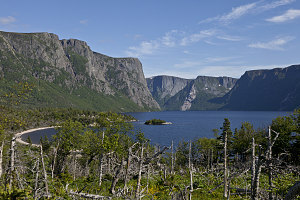 This report describes an overnight (or long dayhike) backpack that starts at the main trailhead for Western Brook Pond, crosses Western Brook, then follows the northern shore of Western Brook Pond to a backcountry campsite nestled in a small cove along the Pond, called Snug Harbour. 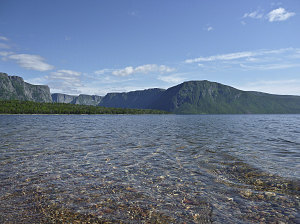 Snug Harbour is near the mouth of the fjord section of the lake, and as a result has a front-seat view of massive cliffs rising up to the north and south. 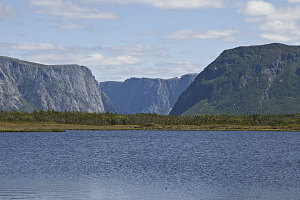 Do not be fooled by the word 'Pond' in the name Western Brook Pond. 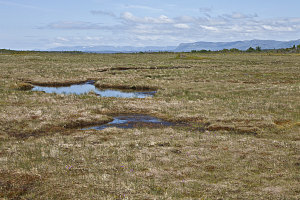 It is actually a fairly large lake, the majority of which sits within a land-locked fjord, created during the last ice age by a large valley glacier. 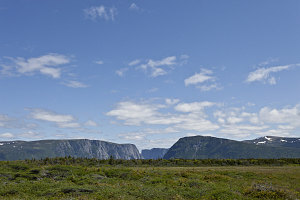 From the flat, 2,000+ foot high plateau of the Long Mountains, the walls of the fjord drop precipitously, almost all the way down to sea level. 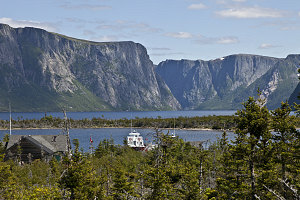 It is one of the iconic scenic highlights of Gros Morne National Park, and is often showcased in park brochures, and many scenic attraction videos of Newfoundland include at least one short clip of some part of it. 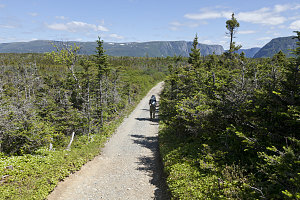 Under beautiful clear skies in late June, we started from the very well-developed Western Brook Pond trailhead. It is extensively boardwalked, wide, easy and flat throughout. 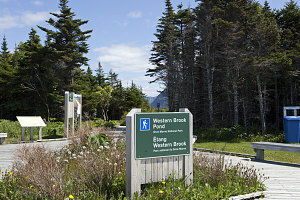 This is the same trailhead that thousands of tourists use to access the Western Brook Pond boat tours, so this first section is very busy during the middle of the day. Leaving the parking lot, we immediately got a nice -- if distant -- view of the Long Range Mountains in the distance. There were some fixed binocular things here if you wanted to get an advance look at things. 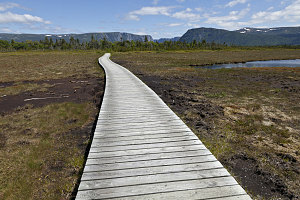 A combination of boardwalk and nice crushed-gravel path led eastward, sometimes through large sections of open bog and marsh, sometimes through a scrubby dwarf forest. 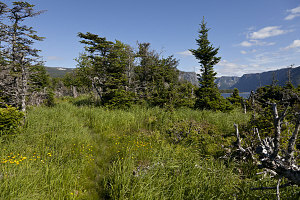 This wide path led 2.5 kilometres to the docks for the boat tours on Western Brook Pond. 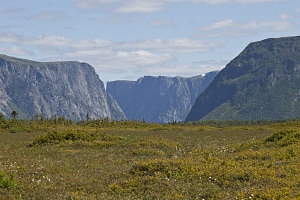 There are two possible turnoffs that lead north to the ford of Western Brook. We took the farther one on the way in (at about the 2.5km mark), and the nearer one on the way out (at about the 2km mark). 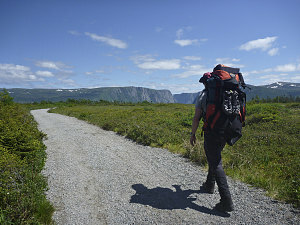 The shortest option is to take the nearer path (nearer to the trailhead, that is). 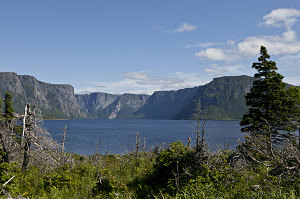 Soon after turning off to the north, we arrived at the ford of Western Brook. 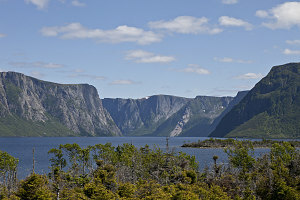 Western Brook should more properly be considered a river. 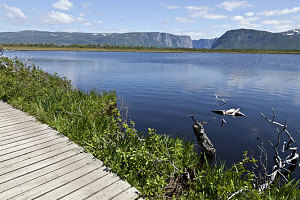 It is about 100 feet wide and it is what drains Western Brook Pond -- which is a very large lake. There used to be a bridge that crossed the brook here, but several washouts have resulted in the Park Service installing a hand line and nothing else. In order to get to the trail on the other side, you must ford the brook. 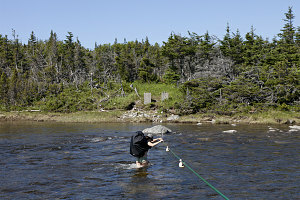 This is the biggest obstacle on this backpack, and could conceivably bar your way if the river level is too high. We carefully packed away anything valuable into a dry bag, unfastened our waist belts, and made our way across holding onto the hand line. 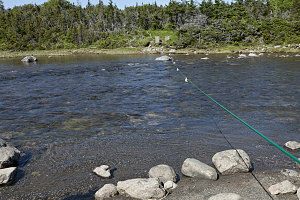 Today, when we went (end of June), the river was at its deepest about crotch-level, and the current reasonable. With a hiking pole for balance, it would likely have been possible to cross without even using the hand line. After the ford, the trail became far less travelled, and far less distinct. 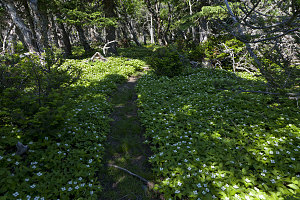 It was, however, quite beautiful: a narrow path, often with a grassy tread, led through a shady, short-treed forest with an understory carpeted in flowering dogwood. 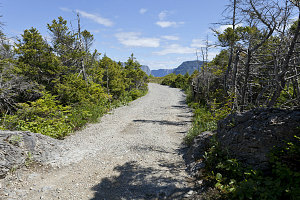 There were a few short stretches of wet, mucky trail, but nothing too serious. 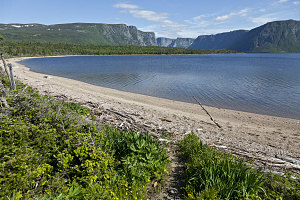 A few more kilometres in, the trail emerged on the shore of Western Brook Pond and followed it for a kilometre. 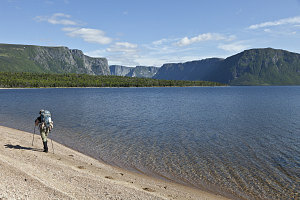 Apart from the nice experience of walking on an airy, open beach, we were given closer views of the Western Brook Pond's fjord's cliffs. 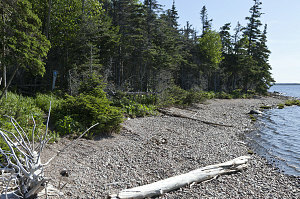 After about a kilometre of shore-walking, a small sign pointed the way back into the trees. 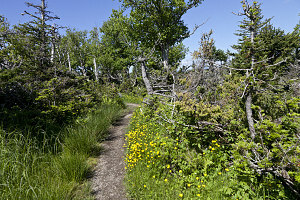 Here the trail made its only significant climb of the entire hike, of about 100 feet of elevation. There were some additional tiresome muck sections along this stretch. The trail then descended off of a slight hill, giving up the 100 feet of elevation that was just gained. 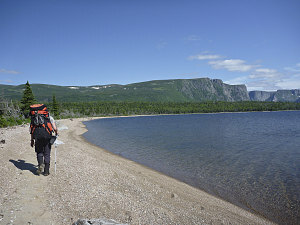 The trail arrived back at the shore of the lake, in the curve of a slight cove. A small creek emptied into the lake here, and there were remnants of an old bridge. Be warned: many people think that this is Snug Harbour, but it is not. 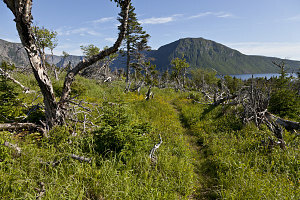 Snug harbour is the next cove along the shore of the Lake.